Villas at Trexler Park - The Villas at Trexler Park. Enjoy maintenance free living in the lovely END Unit town home overlooking private green space. Living room features vaulted ceiling, marble surround gas or wood fireplace plus French Doors leading to brick patio. Center hall foyer is flanked by living room and dining room accessing kitchen through French doors. Eat-in Kitchen is larger than most units in this complex with large center island, large desk area and large laundry space. 1st floor Master is spacious with 2 walk-in closets, large bath with Jacuzzi tub, and tile shower. 2nd level provides space for office or den and has 2 spacious bedrooms with full bath. The brick patio overlooks green space and trees, is very quiet and provides an abundance of privacy. Make your appointment today! There is no sign on Property. 109 Spring Brook Terrace, Nazareth - HOME FOR THE HOLIDAYS! 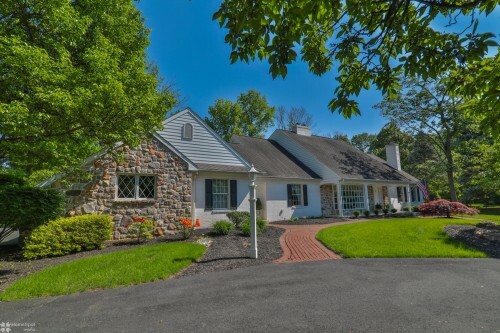 There is nothing to do but move right in this beautifully maintained and decorated colonial directly across the street from the lovely Nazareth Borough Park. This home is warm and inviting with center foyer flanked by living room and dining room leading into eat-in modern kitchen with stainless, granite and limestone back splash. Open concept from kitchen to family room with cozy gas fireplace. French doors from kitchen lead to paver patio with built-in fire pit and private backyard. 2nd floor features large master with walk-in closet and bath with whirlpool and double vanity. 3 bedrooms and laundry complete the 2nd floor. 4th bedroom on 2nd floor is spacious with mixed use appeal. Finished basement provides potential 5th bedroom, office, family room, hobby room and stairs that access garage. Every room has been freshly painted with current colors and will please today's buyers. Home is close to schools, major routes and recreation. Wedgewood Village - Gracious home located in Parkland Schools situated on a corner lot has a lot to offer. Enter the open foyer with impressive turned staircase and hardwood floors offering beauty and warmth. Spacious living room leads to Dining room with hardwood and opens to large eat-in kitchen w/ center island, granite and tile backsplash. Large family room features gas fireplace, brick hearth, hardwood and has lovely french doors leading to office with custom built-ins and gas fireplace. Large bay window in office provides plenty of natural light. Screened-in porch, 1/2 bath and laundry/mudroom complete 1st level. 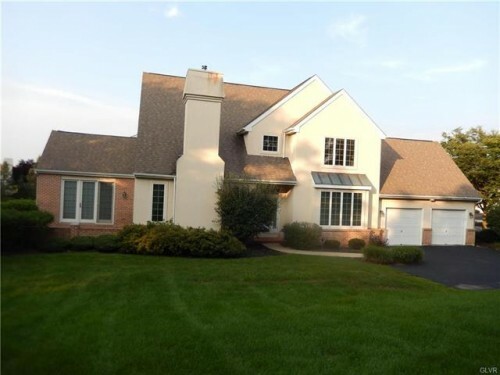 2nd level presents large master suite with sitting room, large master bath with whirlpool and walk-in closet. 3 spacious bedrooms and hall full bath with double vanity and built-in cabinetry complete the 2nd level. Basement provides large finished rec area, and additional storage areas. 2 car garage has extra 1/2 bay with outside entrance. 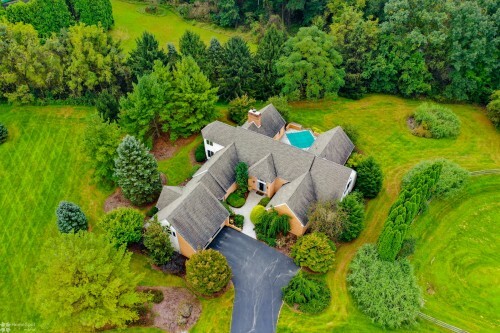 Start the New Year in this Lovely home! The Fields at Indian Creek - Sellers sad to leave this 1 year old lovely home in the new community of The Fields At Indian Creek. This Mayfair 1 model has been eloquently appointed and features many upgrades. Starting with a premium lot location in a private Cul de Sac, the house features 3 bedrooms, 2 full baths, laundry room, sunroom, Lg. living area, dining area and kitchen all with open concept. Upgrades include increased garage size w/ attic storage, upgraded granite in all areas, tile floor in Master Bath shower w/ Block Acrylic window, upgraded carpet pads, upgraded wood floors, gas fireplace, and a dog run, just to name a few. The kitchen includes 2 islands, a wine bar, double sinks and has plenty of prep space and cabinet space. The afternoon sun warms the entire home as natural light pours through sunroom w/ French Doors. The 24x16 deck is perfect for outdoor entertaining and has an 8x8 concrete pad equipped with 220 GFI gas line for possible outdoor kitchen/grill. Lovely Community w/Clubhouse. Harris York - Enjoy carefree living in the private gated condominium community of Harris York. This house was custom built and one of the larger of the homes in the community. Center foyer welcomes you into large living room with vaulted ceilings, skylights with open concept into dining area with gas fireplace and morning room. Large eat-in kitchen with center island and plenty of prep and storage space access back hall to laundry, 1/2 bath and garage. Family room is centered with stone fireplace, custom built-ins, vaulted ceilings and overlooks brick patio with small dipping pool. 1st Flr. Master En-Suite is very spacious with large closet and dressing areas. 2nd bedroom completes the 1st floor. 2nd floor offers 2 large beds both with private baths and generous closet space. Elevator access is from basement to second floor. Basement offers finished office area and storage. Included in sale is adjacent lot/2645 Houghton Lean. Property is in a Trust and is being sold AS IS. 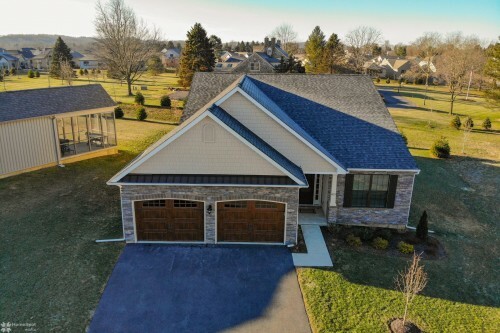 Woodhaven - Stunning Custom Built Stone and Brick Cape Cod is located on a quiet Cul-De-Sac in East Penn School District. The floor plan is open, perfect for entertaining and includes 1st floor Master Suite, office/den with ornamental fireplace mantel, living room with fireplace, dining room, large eat-in kitchen with center island and Sub-Zero refrigerator, family room w/fireplace and sun room filled with natural light. 3 car garage accesses back hall, 1st floor laundry and half bath. 2nd floor presents 2nd "master suite" and 2 more spacious bedrooms with Jack N' Jill bath. Front hall staircase and back hall staircase provide ample access to 2nd floor. Large family room in basement provides exercise and recreation area. Basement also provides tons of storage area with outside entrance. Other features of this lovely home are cedar closets, central vac and storage spaces, lovely patio, gas and wood burning fireplaces, custom architectural elements and charming curb appeal.